We just returned from an amazing weekend in Dallas. 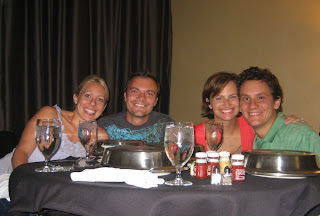 We packed up our munchkins to head to the Big D for a marriage conference and to spend some time with the Steeces'. We had planned to take over their house for the weekend, but unfortunately their AC went kaput; luckily a cool front dropped the temps to 96. With some good ol' help from Priceline, we scored 2 hotel rooms for the price of one for weekend. All 8 of our kids finally met and took over the Westin by storm. It was so fun to see them interact and mimic each other and sleep in some pretty cozy conditions. We decided to put all the kids in one room (5 pack-n-plays and 3 "tents") so the padres could hang out in the other room at night. It all worked out so well with the rooms right next to each other and being able to use the video monitor to watch the kids chit chat way past their bedtime. 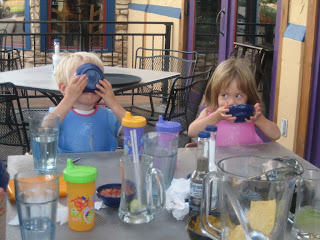 We are amazed that all the kids did so well, being in a new place, around new people, missing naps, and staying up late. 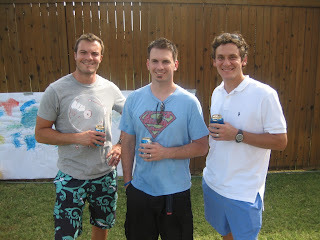 We also had the opportunity to go to the Gerwers' one-and-a-half birthday party. 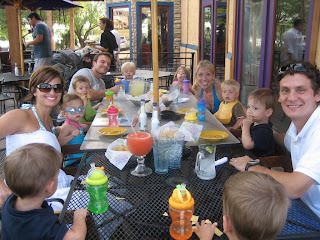 There were children galore - 4 sets of quads (Gerwer, Urech, Steece, Goerlich), and several sets of triplets and twins. I wonder what the neighbors would think if they peeked over the fence. We are so thankful to have the Steece's in our lives and we can't wait for our next family reunion, complete with hugs, kissies, and high fives. You Expect Us to Sleep? Looks like another amazing, fun adventure. What a wonderful gift and blessing to have those friendships and opportunities. The pics are great-especially all of them on the cart. Much love to all of you. Wonderful pics as always! Love to see it when you quad sistas get together!! I love these pictures!! It was so nice to finally meet you in person. 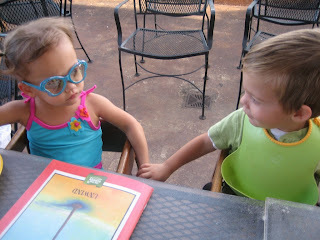 Your kids are so cute. I LOVE the picture of all eight in the luggage cart. COOL!!! Glad you guys had a great weekend. 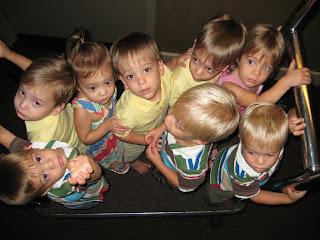 The last pict of the luggage cart with all EIGHT kiddos is ADORABLE! Sounds like a blessed weekend. 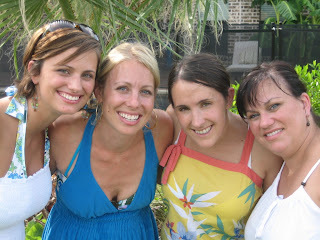 I am so glad you have a network of other quad mamas that are such good friends. Miss you. I love the last pic, so cute! Looks like SO much fun! Michael & I attended a marriage conference just after our quads were born. I LOVE them! Having multiples can strain your marriage so any help is greatly appreciated! (= BTW, I LOVE the pic of them all on the luggage cart! TOO cute! 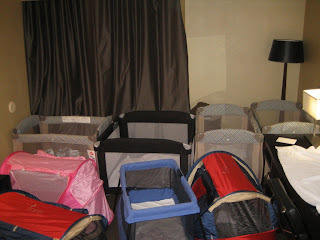 Could you give a little more information on the "tents" I am interested in getting a couple. PeaPod Tents - http://www.kidco.com/main.taf?p=4,5 We had never seen them in person until this trip but they are really cool. Wish I would've started out with these instead of the pack-n-plays! awww! mare!!! joe and i just cannot stop talking about how much fun we had with you guys. 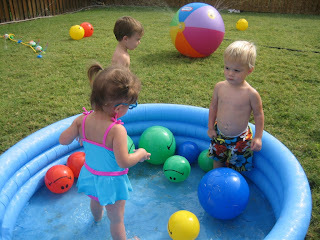 my favorite part was getting to watch our kiddies play together--so special. loved our late night chats in our hotel room! and the marriage conference was seriously- life changing for us. you guys mean the world to us--can't wait to make the houston trip this fall! i'll send you a DVD of the video i took---it is pricless! love you so much!!!! I could CRY over this post. Honestly! Can we come next time? Oh my stinkin' word...you are all too cute and I can't imagine the fun you all had! Love you to pieces. Need to catch up soon! It was SOOOO great to meet you guys in person!! Your kids are even more precious in person! Glad you guys got to come visit and hope you had a good time. Ok, what are those tents?? They look cool! I'm a casting director. I would LOVE for you quads to come in for a Sears National Commercial. The Producer has offered to fly out-of-towners in. Interested, certainly let me know.